The link between whey protein powder and depression relief may come from the amino acid L-tryptophan, also referred to simply as tryptophan. Tryptophan assists in creating serotonin, one of the brain chemicals responsible for moods. Many people who suffer from depression and anxiety disorders lack sufficient serotonin or have problems using the serotonin circulating in the body. A diet rich in tryptophan is one natural method many people try in order to relieve depression. The connection between whey protein powder and depression symptom relief is anecdotal. No rigorous scientific studies have been conducted on the short- or long-term benefits of using whey protein powder to relieve the symptoms of depression. Yet because whey protein powder is inexpensive, readily available and relatively safe to use, it may be worth a try for people who suffer from mild depression and anxiety. Doctors are learning more every day about the connections between depression and anxiety and the body's chemical messengers. Moods are regulated by a complex web of factors including thoughts, behaviors, and chemical messengers. Certain brain chemicals such as serotonin and dopamine can make us feel anxious, relaxed, depressed, or upbeat. According to the Mayo Clinic, the exact mechanism by which all of these chemicals work is still poorly understood. A new class of medications introduced in 1987 called selective serotonin reuptake inhibitors (SSRI) blocks the reabsorption of serotonin by nerve cells in the brain, creating more circulating serotonin and thus elevating moods. The key to the success of SSRIs in reducing depression is their increase in the serotonin production. Serotonin is made in the body from L-tryptophan and is taken in through the foods you eat, typically animal products. 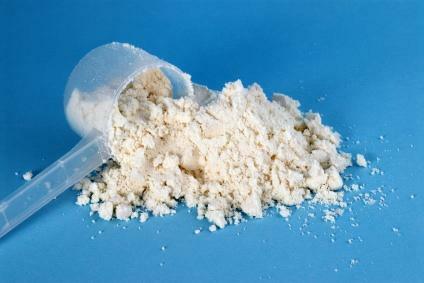 Whey protein powder also contains tryptophan, which is why it may be linked to depression relief. The key to using whey protein powder to offset symptoms of depression lies in providing the body with an abundance of the raw materials it needs to make serotonin. Like a factory that needs materials fed into its complex machinery to produce detailed widgets, the human body needs food, water, and air to create everything from individual cells to the chemical messengers and hormones that regulate all of the body's systems. The body has many safeguards in place to maintain health, such as storing vitamins for times when they may become scarce in the diet. However, the body can still become deficient in certain raw materials over time. Whether individuals who suffer from depression simply produce less serotonin or their bodies do not use it as efficiently as others' do is unknown. But if the raw materials containing tryptophan aren't coming into the body in the first place, it cannot produce enough serotonin. For this reason, many people who begin taking whey protein powder supplements for fitness and health notice their mild to moderate depression lifts. The theory is that the whey powder supplies the missing amounts of tryptophan the body needs to manufacture serotonin. Keep in mind that all of the information linking whey protein and depression is purely speculative and based on comments posted online from people who have noted a correlation between whey supplements and their moods. It's also a theory based on the chemical composite of whey powders, what researchers know they contain, and how the contents may impact the body's chemistry. The hard part of separating whey protein facts from myths is knowing which actions caused lifts in mood. Was it the whey powder or the fact the people taking it were engaged in vigorous physical activity? A Harvard Medical School publication points out that numerous studies indicate vigorous physical activity helps alleviate depression. So were the athletes taking whey protein feeling better because of the tryptophan in the whey supplements or because they were regularly working up a sweat? No one can know for sure until researchers conduct experiments on whey protein powder and depression using the same double-blind, placebo-controlled method they use when testing SSRI drugs. Until that time, people suffering from mild depression can still try taking whey protein powder and exercising regularly to try to alleviate the blues without taking medication. Herbal or vitamin supplements may also help. Depression is a serious illness, and if you are feeling so depressed you are having difficulty functioning, sleeping, or working, be sure to seek medical attention. Never stop taking medications without talking to your doctor; many SSRI medications produce severe side effects if you stop taking them abruptly. Above all, seek treatment from a qualified professional if you feel you are suffering from depression.